We have Kids Swimming Goggles for 2 year old toddlers through to teenagers and they all feature the very best in Aqua Sphere technology. Our Kids Goggles are Made in Italy with Easy-to-Adjust Buckles and made with our Softeril Material, which is Hypoallergenic, Latex Free, Soft and Comfortable. They have Plexisol Lenses, which are 20x more resilient than normal lenses with 100% UV Protection, Superior Transparency and are Scratch and Fog Resistant. 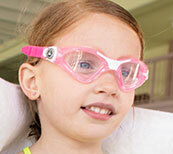 Great goggles for toddlers with a strong one-piece frame and easy to adjust side buckles. 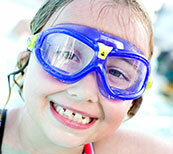 More comfortable for young swimmers as they seal around the eyes rather than the eye socket. Comfortable, low profile swim mask with push-button buckles for easy strap adjustments. 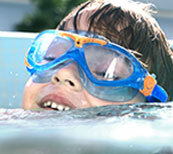 A good all-round swim goggle for young aspiring swimmers, and triathletes. 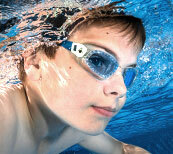 One of the best swim goggles on the market for junior swimmers and triathletes.